"Who doesn't love puppies coming to class?" First-year students from Clinical Vision Science recently enjoyed a visit from some special guests — guide dogs in training from the CNIB. The visitors were a 13-month old black lab named Marion, and a yellow lab named Luna, who recently arrived from Australia. 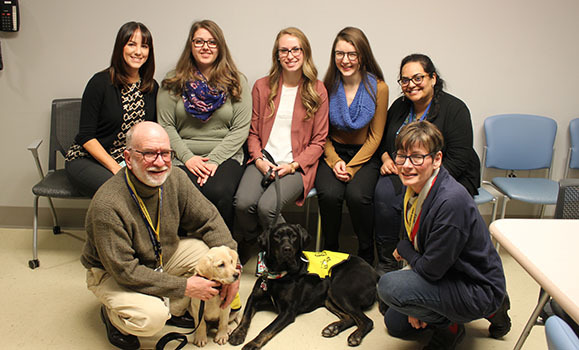 The students in Heather Fennell-Al Sayed’s Therapeutic and Psychosocial Aspects of Low Vision class enjoyed meeting the pups, and learning more about the CNIB’s guide dog program. It was the first time the guide dogs were brought to class. Masters in Clinical Vision Science student Aruna Krishnamurthy says it was an amazing experience to have the guide dogs visit. “As I walked into the classroom, it was instant happiness just seeing the two dogs.” She adds the experience provided valuable insight into the training the dogs receive and the work done by the CNIB and other national guide dog training organizations, and volunteers. Prof. Fennell-Al Sayed says the class will keep up to date on Marion and Luna via their Instagram pages, and hope to have them back again next year. There are four national guide dog training organizations in Canada, including the CNIB and the Canadian Guide Dogs for the Blind.